The Wattled Crane, Bugeranus carunculatus, is a large bird found in Africa south of the Sahara Desert. It is 172 cm (six feet) tall and weighs 7.8 kg (fourteen pounds). The back and wings are ashy gray. The feathered portion of the head is dark slaty gray above the eyes and on the crown, but is otherwise white, including the wattles, which are almost fully feathered and hang down from under the upper throat. The chest, primaries (longer wing feathers), secondaries (shorter, upper arm feathers), and tail coverts (feathers coveriare black. The secondary flight feathers are long and nearly reach the ground. The upper breast and neck are white all the way to the face. The skin in front of the eye extending to the base of the beak and tip of the wattles is red and bare of feathers and covered by small round wart-like bumps. Wattled Cranes have long bills and black legs and toes. Males and females are virtually indistinguishable, although males tend to be slightly larger. The Wattled Crane occurs in eleven sub-Saharan countries in Africa, including an isolated population in the highlands of Ethiopia. More than half of the world’s Wattled Cranes occur in Zambia, but the single largest concentration occurs in the Okavango Delta of Botswana. Wattled Cranes are thought to have historically ranged over a much larger area including coastal West Africa. All cranes are omnivorous. The principal food of the Wattled Crane is aquatic vegetation, including the tubers and rhizomes of submerged sedges and water lilies. 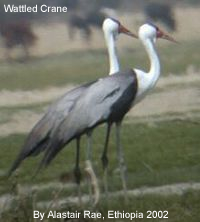 In particular, Wattled Cranes depend heavily on the sedge Eleocharis spp. In dryer upland habitats, Wattled Cranes forage for grain, grass seeds, and insects, and they make use of agricultural fields when convenient. Destruction, alteration, and degradation of wetland habitats constitute the most significant threats to the Wattled Crane. Hydroelectric power projects and other water development have caused fundamental changes in the species expansive floodplain habitats, and their most important food source Eleocharis spp. Human and livestock disturbance, powerline collisions, mass aerial spraying tsetse flies, and illegal collection of eggs, chicks and adults for food are also significant threats to Wattled Cranes throughout their range. The population is about 8,000. The Wattled Crane is one of the species to which the Agreement on the Conservation of African-Eurasian Migratory Waterbirds (AEWA) applies.